The Society for Marketing Professional Services (SMPS) Boston chapter held its annual Awards for Marketing Communications and Achievements at the State Room on Thursday, June 7, 2018. The event honors firms and individuals who have made outstanding contributions through communications vehicles to the A/E/C industry in the last year. Encompassing all aspects of the profession, the winning entries were chosen by a panel of judges this spring. Award recipients were celebrated at the gala event, which was hosted by SMPS Boston Special Events Committee Director Jennifer Tulipani. SMPS 2017-2018 President Pia Cardinali from CRJA IBI Group and Sarah Hotchkiss of Commodore Builders were also on hand to present. A number of firms were recognized for superlative performance in the categories of Corporate Identity, Special Event Marketing, Social Media, Website, Holiday Piece, Brand Awareness Campaign, Marketing Collateral, Internal Communications, Recruitment and Retention and Video. The nominees were also presented to the chapter at large for a People’s Choice award. Finally, the Volunteer of the Year, New Member of the Year and Marketing Professional of the Year were recognized for their outstanding contributions to the chapter! Congratulations to all the winners! You are an inspiration to the entire chapter. SMPS Boston wants to extend a sincere thank you to this year’s judges: Jennifer Hegerty, PayetteJessica Knapp, Dimella Shaffer; Shannon Koop, GEI Consultants; Susan Shelby, Rhino Public Relations; Matt Stumm, Stark Raving; Maria Tatasheik, Limbach; Pat Tracy-Callahan, VHB; Jennifer Bentley, Elkus Manfredi; Julie Brown, JB|BD; Walt Chaffee, Geocomp; Caroline Fitzgerald, Bond Brothers; Lisa Frisbie, AGC; Leann Gebhardt, GEI Consultants. And a heartfelt thank you to our 2018 Gala sponsors Design & Company, Chapman Construction you made the cocktail hour & networking reception possible. Thank you, Chapman Construction, VHB, Acentech, 52X Consulting, and GEI , Clockwork Design, Daniel O’Connell’s Sons; MPA, Robert Benson Photography, Corderman & Company, Bulfinch Companies, SMMA and Simpson Gumpertz & Heger. The Society for Marketing Professional Services (SMPS) Boston chapter held its annual Awards for Marketing Communications and Achievements at the Liberty Hotel on Thursday, June 8, 2017. The event honored firms and individuals who made outstanding contributions through communications vehicles to the A/E/C industry in the last year. Encompassing all aspects of the profession, the winning entries were chosen by a panel of judges. Award recipients were celebrated at the gala event, which was hosted by SMPS Boston Special Events Committee Director Andrea Labron. 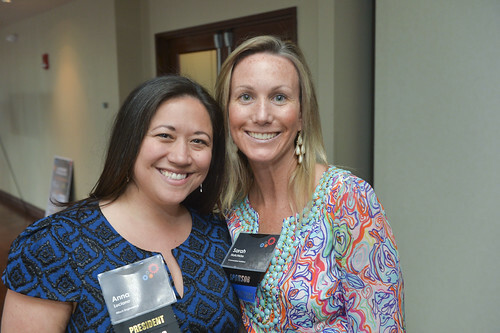 SMPS 2016-2017 President Sarah Hotchkiss of Commodore Builders and Anna Luciano from Nitsch Engineering were also on hand to present. A number of firms were recognized for superlative performance in the categories of Corporate Identity, Special Event Marketing, Social Media, Website, Holiday Piece – Digital, Holiday Piece – Print, Brand Awareness Campaign, Marketing Collateral, Internal Communications, and Video. The nominees were also presented to the chapter at large for a People’s Choice award. Finally, the Volunteer of the Year, New Member of the Year and Marketing Professional of the Year were recognized for their outstanding contributions to the chapter! SMPS Boston wants to extend a sincere thank you to this year’s judges: Laurie Strickland, CPSM, Nitsch Engineering; Matt Hawk, Stantec; Sarah McGillicuddy, Acentech; Deana Martin, Bond Brothers; Susan Shelby, Rhino PR Dana Kelly, Bruner Cott; Liz Fennessey, Haley & Aldrich Marc Margulies, Margulies Perruzzi Architects; Luciana Burdi, MassPort; Glenn di Benedetto, The Green Light N Go; Jan Breed, Mass. Building Congress; Ileen Gladstone, GEI Consultants Inc.
And a heartfelt thank you to our 2017 Gala sponsors Design & Company; IMS Integrated Marketing Systems; Commodore Builders; VHB; 52X Consulting; ARC Architectural Resources Cambridge; Bond; C.E. Floyd Company, Inc.; GEO Consultants; Nepture Web; Acentech; Bowdoin Construction; MPA Margulies Perruzzi Architects; Simpson Gumpertz & Heger; Vanderweil and Flagship Press. Kate Shoss, The Bullfinch Companies, Inc. The Society for Marketing Professional Services (SMPS) Boston chapter held its annual Awards for Marketing Communications and Achievements at the Revere Hotel on Thursday, June 9, 2016. The event honors firms and individuals who have made outstanding contributions through communications vehicles to the A/E/C industry in the last year. A fantastic time was had by all thanks to the tireless efforts of the SMPS Boston Special Events Committee, led by Andrea Lalinde of CDM Smith. A number of firms were recognized for superlative performance in the categories of Brand Awareness, Social Media, Holiday Piece (Digital and Print), Website, Corporate Identity, Special Event Marketing, Marketing Collateral, Media Relations, Best In-House Design, and Best In Show. The nominees were also presented to the chapter at large for a People’s Choice award. Finally, the Volunteer of the Year, New Member of the Year and Marketing Professional of the Year were recognized for their outstanding contributions to the chapter! A heartfelt thank you to the judges: Andrew Beaton, CDM Smith; Jessica Darling, Stantec; Andrea Gabrielle, Neptune Web; Scott Geiger, Reed Hilderbrand; Lily Hamel, Shawmut Printing; Kathy McMahon, National Development; Leah Palone, Boston Magazine; Jill Scolnick, The Graphic Group; Patricia Tracy-Callahan, VHB; and Richard Yeager, Boston College. The Society for Marketing Professional Services (SMPS) Boston chapter held its annual Awards for Marketing Communications and Achievements at the Revere Hotel on Thursday, June 4, 2015. The event honors firms and individuals who have made outstanding contributions through communications vehicles to the A/E/C industry in the last year. Encompassing all aspects of the profession, the winning entries were chosen by a panel of judges this spring. 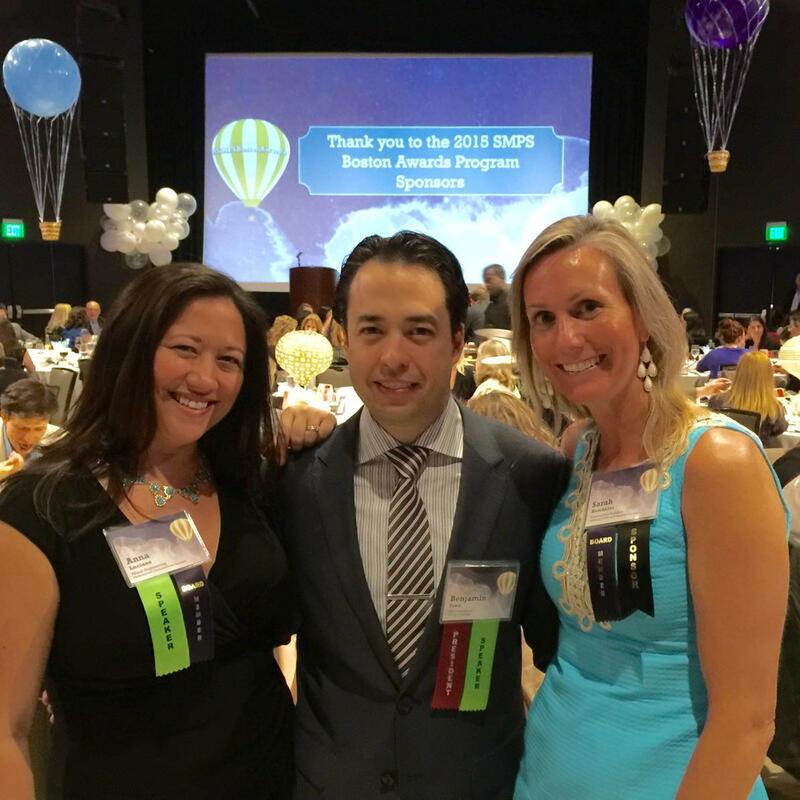 Award recipients were celebrated at the ROC Awards gala event, which was hosted by SMPS Boston 2014-2015 President Ben Sawa of GEI Consultants and President-Elect Anna Luciano of Nitsch Engineering (both at right with rising President-Elect Sarah Hotchkiss of Commodore Builders). A fantastic time was had by all thanks to the tireless efforts of the SMPS Boston Awards Committee, led by Rebecca Roy of BOND. A number of firms were recognized for superlative performance in the categories of Integrated Marketing Campaign, Digital Media, Holiday Piece, Website, Brand Experience/Identity, Special Event Marketing, Marketing Collateral, Best In-House Design, and Best In Show. The nominees were also presented to the chapter at large for a People’s Choice award. Finally, the Volunteer of the Year, New Member of the Year and Marketing Professional of the Year were recognized for their outstanding contributions to the chapter! A heartfelt thank you to the judges: Ed Bond of BOND, Pat Tracy-Callahan of VHB, Nazneen Cooper of Harvard University, Dana Kelly of Bruner/Cott Architects, Shirin Karanfiloglu of DCAMM, Anthony Leone of Leone Design, Fiona Luis of ArchitectureBoston, Maureen McDonough of Harvard Allston Development Group, Christina Mosholder of Fort Point Management, Michael Potter of Jones Lang Lasalle, marketing consultant Mark Ruckman, Laurie Strickland of Nitsch Engineering, Dan Tater of ADK Group, and Catherine Walsh of Northeastern University. The Society for Marketing Professional Services (SMPS) Boston chapter held its annual Recognizing Outstanding Communications (ROC) Awards for Marketing Communications and Achievements at Taj Boston on Thursday, June 6, 2014. The event honors firms and individuals who have made outstanding contributions through communications vehicles to the A/E/C industry in the last year. Encompassing all aspects of the profession, the winning entries were chosen by a panel of judges this spring. Award recipients were celebrated at the ROC Awards gala event, which was hosted by SMPS Boston President Sarah McGillicuddy of Acentech and emceed by Judy Nitsch of Nitsch Engineering. A fantastic time was had by all thanks to the tireless efforts of the SMPS Boston Awards Committee, led by Rebecca Roy of BOND. A number of firms were recognized for superlative performance in the categories of Website, Integrated Marketing Campaign, Event Marketing, Holiday Piece, Marketing Collateral, Brand Identity, Best In-House Design, and Best in Show. The nominees were also presented to the chapter at large for a People’s Choice award. Finally, the New Member of the Year and Marketing Professional of the Year were recognized for their outstanding contributions to the chapter! A heartfelt thank you to the judges: Krista Bourque of ADD Inc., Molly Campbell of Design New England, Mike Comtois of Rolf Jensen & Associates, Pam Delphenich of MIT, Jennifer Hegarty of Payette, Marlene Hobel of CDM Smith, Matthew King of Nickerson PR, Anne Kroger of CannonDesign, Maureen McDonough of Harvard Allston Development Group, Pamela de Oliveira-Smith of the Boston Society of Architects, Ed O’Rourke of GEI Consultants, and Catherine Walsh of Northeastern University. The Society for Marketing Professional Services (SMPS) Boston chapter held its annual Recognizing Outstanding Communications (ROC) Awards for Marketing Communications and Achievements at Boston’s Omni Parker House Hotel on Thursday, June 13, 2013. The event honored firms and individuals who made outstanding contributions through communications vehicles to the A/E/C industry in the last year. Encompassing all aspects of the profession, the winning entries were chosen by a panel of judges and award recipients were celebrated at the ROC Awards gala event.